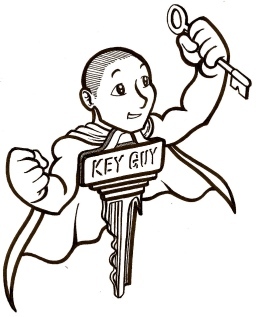 Click here to open an account with The Honolulu Key Guy: Locksmith & Key Maker! "I Saved Money and Time"
1) I need the registration for my vehicle in order to prove its mine to the dealer in order for them to make me the key. So, that means I need to get it opened by a locksmith which might be anywhere between $30-$80 on this island, which i found out by calling over 30+ Lock Smiths in Oahu. 2) Then the dealer tells me that they have to send the key to get cut on the mainland because they don't know anyone who does laser cuts for keys here in oahu. The process would have taken over a week. So, I called over 30+ locksmiths and none of them can do that plus program it. 3) Then if I choose to go with the dealer I would have hade to wait over a week for my new key plus tow my car from MCBH to honolulu, which I found out the cheapest tow truck company does that for $250 plus tax. So, thank god I did my research and the only locksmith I could find in oahu that does laser cut keys and programs it is The Key Guy. He drove to MCBH, opened my car, took the lock out, went back to his shop made a copy of my key somehow by looking at my lock, came back to MCBH programmed the key. And I was one happy customer! Do you know how much he charged me!?!?!? If I would have went with the dealer I would have spent around $600, gone through a hassle, and probably would've had to spend even more money on a rent a car. Thank you...The Key Guy! "Good service, not on Aloha time!! !‎"
Finally a service in Hawaii that wasn't on aloha time! He was professional, courteous and quick. Came to my house in the morning even after he had a terrible incident the night before. Had great customer service and was very knowledgable. You can't beat the prices this guy offers you, but the main thing for me was his customer service and professional yet friendly demeanor. I would definitely recommend him to friends and people that get locked out or lose their keys--he does door and car keys too!!! "Good people with good hearts. I respect that." I've used The Key Guy several times already, and they took really good care of me every time, so I figure it's time I paid them back and wrote a nice review. I got some good stories about them. First time I called them, I got their number from my Auntie Laura. She had told me they made one of those electric clicker car keys for her. I had some kind of problem where the key wouldn't turn in the ignition. Was stuck. Stuck really good. My car is kind of a pos kind, so I really really really didn't want to spend money towing it to the dealer. A nice baldhead guy from Key Guy came and worked on it for like two hours. And he said he couldn't fix it, so NO CHARGE. I was like d--- man worked for two hours!!! no money??? turned out my car needed some kind of special part from the mainland, so he would call me when it came in. no need to pay him for anything until he actually fixed my car. I never met anyone worked two hours for nothing. This is one Nice Guy. TRUE ALOHA. oh and after that he came back and fixed my car real nice. After that, I called them two more times. They them unlock my apartment for me two times. Second time the locksmith said I should get a lockbox like the realtors use so I don't lock myself out anymore. I was like hey aren't you losing out on my business that way? He said nah I feel bad for you, paying me so much moneys! Key Guy is good people with good hearts.